There are a few reasons I stopped writing essays on my blog. One, I got paranoid. I follow a lot of women scientists on Twitter. Every time they express an opinion they get attacked by horrible trolls. I thank my staggering unpopularity this hasn't happened to me. I didn't want to push it, so I shut up. Second, I got distracted by a new hobby. I started teaching myself how to knit last winter. My grandmother taught me how to knit when I was a baby but I gave it up after a misshapen scarf and a washcloth. It was sort of dull, back and forth. I took up counted cross-stitch and sewing clothes from patterns instead. Then last year bulky knits were in style and they looked pretty fast to knit. I thought I'd try it again. I found YouTube videos of all different nationalities with different styles of knitting, different techniques and stitches and all the shapes you can make. I wanted to learn all about it. It's as complex as joinery in woodworking. But the materials are so easy to order in the mail! This is my new favorite thing. One catch, I still live in a tiny house with a tiny lab ~450 square feet total. I forgot all about that and ordered 6 hats from Sierra Trading Post at 1:00 am one night. 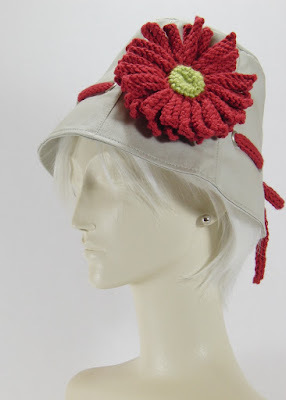 I was excited about the idea of putting flowers on machine-made hats. Well, they came in the mail, all flattened out. I ironed them and shaped them and customized them with my new knitting skills. Now I'd really like to mail them off to good homes. For $10 for postage you can have one. I'm trying my blog as a way to compile the photos. I'm not planning to turn this into a knitting blog. But I could change my mind. 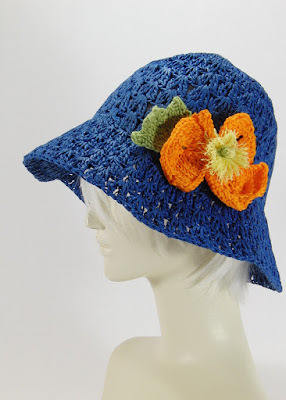 The Poppy Floppy Hat is a Mad Bomber brand hat woven of paper. It can be rolled up for packing. It is made for a very large head, 23" would be fine. 22" you might need to flip up the back to keep it from hitting your neck. It's kind of heavy and might make a better wall decoration honestly. The poppy has three asymmetrical petals knit from mercerized cotton. I made up the realistic looking center of acrylic and a cotton, bamboo, and silk blend elastic yarn. This Mad Bomber woven paper cap is also sized for a large head. It's unlined and airy like the Poppy Floppy Hat but it is very light and comfortable, as long as you don't have a child-size head like me. If you have a grown-up size head this will be cute. The decoration is a quick crochet job of an elastic yarn I got for making headbands for my little cousins. The low price reflects how fast it was to make this flower. It came folded down the middle. It is a big resistant to going back to a good shape. I used an iron on it. I don't know how it would do packed in a suitcase. 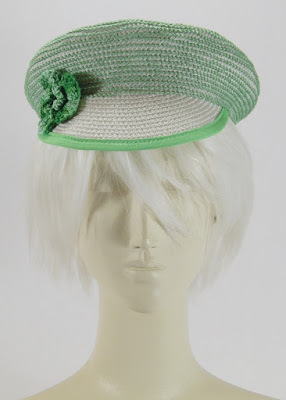 I love this Dustmop Daisy Bucket Hat. This one is also too big for me but I could cinch up the cord. If nobody wants it that won't hurt my feelings one bit. I will keep it for myself. If you had a big bun of hair it would fit in the top part. My niece Brenna could wear this hat with all her hair inside. I don't think she is the kind of person who would appreciate strangers asking her why she has a wastepaper basket on her head though. I'm still working on a snappy comeback for that inevitable remark. Any suggestions, put 'em in the comments. This daisy is 32 individual knitted petals. It took me days. It was supposed to be a Gerbera Daisy with another ring of petals in the middle. When I finished it looked funny. I was pretty disappointed. Then I realized I could un-knit the contrasting color I had in the center without unsewing the individual petals attached to the green part. I threaded a piece of the bright green yarn through the stitches and pulled out the second red color. So much better! This is sewn on by the center. The petals are loose and floppy, very like a dustmop. I propped the top petals up for the picture but as you move your head they will flop around. I knit a cord out of the leftover red yarn and replaced the stiff cotton cord that came in the hat. The red yarn is a cotton, modal, and silk blend. The green center is 100% acrylic. This is a 100% organic cotton Cov-Ver brand hat. It is fully lined and has an orange silkscreen of a pair of surfers on the inside. It's supposed to be crushable but I did iron it when I uncrushed it after it came in the mail. The hat I named the Doublemint Newsgirl is another Mad Bomber hat made out of paper. I crocheted this flower out of 100% cotton yarn in under an hour, thus the low price. This hat is the smallest one of the bunch. It rides very high on the top of the head. It's kind of odd so I suspect I might get to keep this one too. It packs very flat, but is not keen on crushing. It doesn't provide much sun protection, but will cover up an unruly cowlick perfectly. 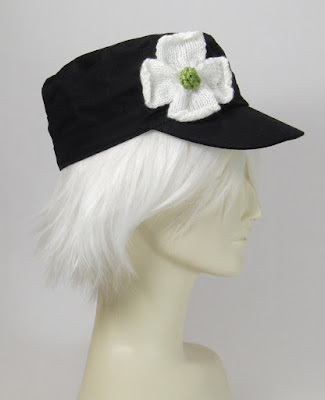 This is black hat with a white dogwood blossom is a Betmar brand hat. It is 55% linen and 45% cotton, but the lining is a poly/cotton blend. I made my usual dogwood pattern with fine white acrylic yarn and tiny knitting needles to see how small it would get. I think it fits nicely on the hat. You may need a lint brush after you pack the hat though. The black shows every loose white fiber. There is no adjustment on this hat. It is too big for me but would probably fit a normal size grown up with a 22" circumference head. 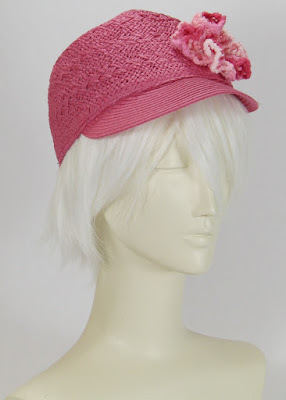 The Dogwood Cloche is also a Betmar brand hat. This one gives the most shade on your face of any hat here. 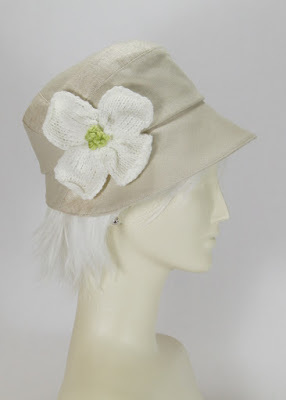 The dogwood blossom is knit of a cream colored cotton acrylic blend with an acrylic center. This was my first try at making a dogwood come out flat on the back instead of with a sort of stem. I'd been making them with stems to put on door wreaths. I thought the center of this one came out a bit too small so I added some extra yarn twists. They make it look very much like the cyme in the center of the four white bracts. I like realism. The hat is 55% linen and 45% cotton. The poly/cotton lining has an interesting pattern of gray and pink bubbles on it. It is too big for my 21" head. A 22" noggin would be perfect. If you would like to buy a hat or any other knitted item from me please email me with my online identity, Beachton. I used Google's free email. I don't use mailto: tags in html because spam. You just have to figure it out and type it. If you send me money with PayPal I will pack the hat and take it to my mailbox for USPS to collect. I can print Priority Mail labels online. Also if anybody knows a better way to display product without the expense and overwhelming volume of ebay and Etsy or the frustrating limitations of Google Sites please tell me in the comments.